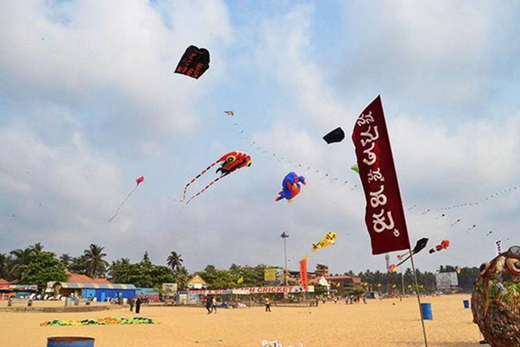 Udupi, March 31, 2019: At the kite festival organised by the District Systematic Voters’ Education and Electoral Participation (SVEEP) Committee, and the Malpe Beach Development Committee on Malpe beach March 30, Saturday; it was a festival of kites of all colours, sizes and shapes. The objective of the festival was to create voter awareness and encourage everyone to vote in the parliamentary elections in Udupi district. Polling for the Udupi-Chikkamaglauru parliamentary constituency will be held on April 18, and for the Shivamogga parliamentary constituency on April 23. Byndoor Assembly segment in Udupi district is part of Shivamogga parliamentary constituency. Persons with disabilities also participated in the voter awareness programme on the beach. They held placards which gave the messages of importance of voting in the elections. In addition to this, there were cultural programmes at the beach to convey the mwssage. Professional kite flying teams from Bengaluru, Mysuru, Chickballapur and other areas participated in the fest. There were a variety of kites flying in the sky including those in the shapes of teddy bear, dragon, ring, pipeline and LED kites. Sindhu B. Rupesh, CEO of Zilla Panchayat and President of District SVEEP Committee, inaugurated the festival by flying a kite. Gracy Gonsalves, Deputy Director of Women and Child Development Department, and others were present. The fest will continue on Sunday also.